Published in Centerville in 1947. 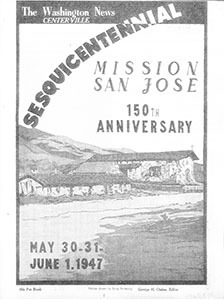 This booklet was produced in conjunction with the Mission San Jose 150th Anniversary Celebration (Sesquicentennial), which took place on May 30-31 and June 1, 1947. The booklet details life in Washington Township (now Fremont, Newark and Union City) during the time period. Many photographs and ads from local businesses are inside. 50 pages total in black and white.